Thank you for purchasing the Neo FreeRunner. This is the second phone developped by the Openmoko project. This guide will help you get to know your Neo FreeRunner and how to start using your Neo FreeRunner. 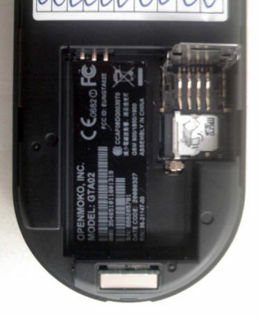 Remove the rear cover of the Neo FreeRunner by first holding the Neo FreeRunner on the side and then use a credit card (or your fingernail, if you have strong fingernails) to prise off the rear cover at the slot on top of the device. Open the case like this. Now you should be able to locate the combined SIM and Micro-SD card holder at the bottom of the battery compartment. Unlock the SIM card holder by sliding the metal clip down, towards the USB socket, with your fingernail. Use caution, as these parts are delicate and could be damaged by forcing them in the wrong direction. Put the SIM card and SD card here. Lift up on the SIM card holder. Before using any Micro-SD card, have a look to the list of known to be supported Micro-SD cards. 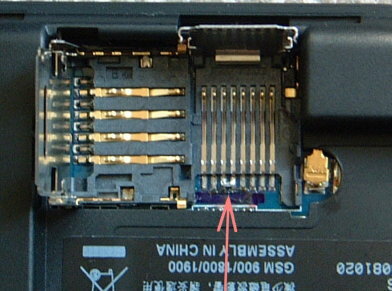 The Micro-SD card holder is held in place by a latch on either side. 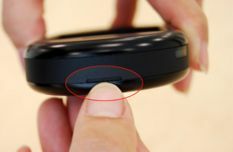 It is easiest to open the Micro-SD card holder by releasing these latches one at a time rather than by lifting from the middle, as lifting from the middle tends to increase the latching pressure. A small screwdriver or knife can be used for this, though it's strongly deprecated. Refer to this photo footage for a simple yet handy little hack involving some scotchtape, to make your life easier. Insert the Micro-SD card into the Micro-SD card holder. Note that on the inside of metal part of the holder there are little holding tabs for the card. Slide the card in these holders (on the metal part) before closing the card holder. Note that the electrical contacts should face down and towards the edge of the Neo FreeRunner. Close the Micro-SD card holder, making sure that both latches of the holder are securely fastened. 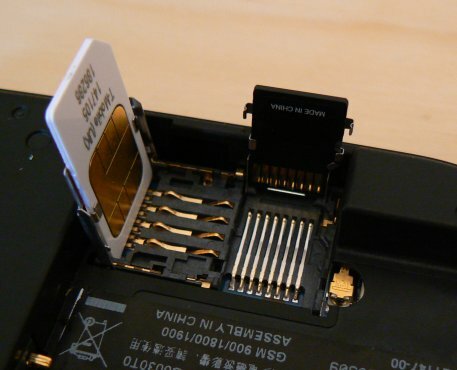 Insert the SIM card into the SIM card holder, taking care to slide inside the two metal tabs in the cover. Note that the electrical contacts should face down and that the cut corner should be closest to the external GPS Antenna Socket. Close the SIM card holder and lock it by sliding the metal clip towards the external GPS Antenna Socket on the FreeRunner. Insert the battery into the battery compartment, aligning the electrical contacts on the battery with the electrical contacts in the battery compartment. Insert the side with the electrical contacts first. Replace the rear cover on the FreeRunner. A short video is also available. It was shot using the previous version of the Neo, but the installation procedure remains the same. Before using the Neo FreeRunner for the first time, you should charge the battery completely. The battery can be charged using the provided charger at 1000mA or from a powered USB port capable of providing 500mA worth of current. Most computers will be able to charge the FreeRunner without any problems. Neo FreeRunner does NOT charge when powered off, so be sure to turn it on and allow it to boot all the way to the GUI (Graphical User Interface). This should happen automatically when you plug in USB power, either from a computer or the provided charger. If it does not, you can turn the power on manually by pressing and holding the power button, which is located just below the USB jack. Although the provided charger is rated at 2A, the maximum charge rate of the Neo FreeRunner is 1A, and thus the charge rate with the charger is less than the charger capacity. The provided charger includes three "national" plugs. The default is North America, with alternative U.K (3 square pins) and Euro (two round pins) adapters. To install the alternative power adapters, depress the latch in the cover (on the opposite side of the charger from the product information label) and slide the cover outward. Note that the two North American pins do not come out; the other adapters slide over them, and snap into place. The two-pin Euro adapter is removed in the same way as the cover. The three-pin U.K. adapter is removed by gently pressing the dummy ground pin (black) toward the end of the adapter with the cord and then sliding it off the adapter. *) charging with 100mA will occur only if device is suspended, as otherwise system takes more power than the 100mA provided by USB power source, and your battery never reaches full capacity or even drains slowly. NOTE: See Neo FreeRunner Hardware Issues about not allowing the battery to discharge completely. Tapping the power button suspends the GTA02. Tapping or holding the Aux button locks the screen. The phone jack is a 2.5mm connector with four contacts: stereo + MIC. 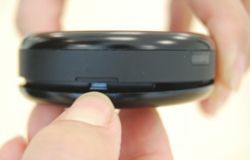 It is compatible with the headsets used by Motorola smartphones (A780,A1200, ...) and the V-360. More information on Headset page. remember your date code, the bottom of your shipping box should have a sticker stating it. These two are important, as they allow you to know which image is flashed on your phone at the factory (c.f. Distributions and Neo FreeRunner (aka GTA02) revisions). 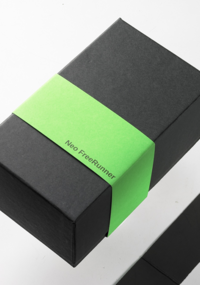 Almost all of the software on the Neo FreeRunner can be updated, including the bootloader which is needed to power up the device and the software on the GSM chip. By default, the Neo FreeRunner comes with a default distribution flashed in, so you should not need the following yet. Go read OM 2008 manual to start with your phone right now. You will probably flash your phone later to switch to a newer and actively maintained distribution. The current version of the GSM Firmware is called Moko 11. If you do not have this version installed yet you should do an upgrade, which will fix several issues related to the phone functionality of the FreeRunner. This works by starting the FreeRunner from a system installed on the uSD, which will automatically apply all needed instructions to flash the GSM firmware to the chip. The uSD image will have to be written on a uSD, which will overwrite all its content, so as to make sure it is repartitioned correctly and that it contains the correct bootable system. The procedure has proven to do a reliable job on flashing MOKO11 to GTA02. Chances anything fails are minimal if you _strictly_ follow the instructions. There's no way to do any harm to your device by using this method. Take special care though about the destination of `dd`, it has to be the *physical* device (e.g. foo0) of your uSD-card, *not* any partition (e.g. foo0p1). Also make sure there are *no* mounted partitions left on the uSD when starting `dd`! Triple-check you are not accidentally overwriting your system-HD, by e.g using /dev/sda instead of /dev/sdc! Double-check once more! This is the one-typo-kills-system case ;-) You've been warned. Download and untar http://people.openmoko.org/joerg/calypso_moko_FW/moko11/flash-moko11_uSD-image.tar.gz on your desktop computer. Read the README.tx file that came with the tarball. Insert a uSD to your computer's reader, and unmount all uSD-partitions that might have been automounted (use mount or df -h to check). Do not use "safely remove" for this. Execute sync or eject <device> to make sure everything is flushed to the uSD before physically removing it from the reader. Insert the uSD to your FreeRunner, boot from NOR-U-Boot and select the "Boot from microSD" option. If you don't have a uSD reader on your PC, you can dd from the Neo: install task-base-smbfs, u(n)mount /media/card, mount the directory in which you have the flash-moko11-2.image file and do the dd stuff. This will take about 12 minutes. Using this gzip method, you can actually do the update with an in place image as long as it is shell enabled and has 92M free on the main file system (all but Android and Neovento right now). Just get the 92M gzip file to the phone, use the above line to extract it to the card after unmounting. Whether you have Qi installed or not (see above) as your boot loader, you must power up to the NoR menu (Hold AUX Key, press Power button) and select "Boot from microSD (fat/ext2)" to begin the installation process (per DocScrutinizer in #openmoko). Do not let Qi boot the uSD. Although it still seems to flash OK, the green "d_o_n_e" does not show up, to give you the warm feeling that everything is OK.
You can confirm the firmware version number using the mickeyterm (cmd: "AT+CGMR"). In SHR-Settings, Phone/Modem Information will supply the same number. This section describes how to install a distribution on the internal flash memory of the Neo FreeRunner. If you want to install it on the memory card please refer to the guide provided by the distribution. For installing a new distribution you will need two files, a root file system (rootfs) image and a kernel image. The root file system image usually ends with ".jffs2", and the kernel image ends with ".uimage.bin". You can get these files from http://wiki.openmoko.org/wiki/Download . Use the program NeoTool to install the distribution on your FreeRunner. The flashing process can take up to 15 minutes for a ~70MB image. It is also wise to make sure that your Neo has enough battery charge prior to flashing. This page was last modified on 28 July 2010, at 12:24. This page has been accessed 100,908 times.